He's kinda got a reason to suspect the Guardians' decision making when picking Lanterns. I mean Sinestro? Guy? 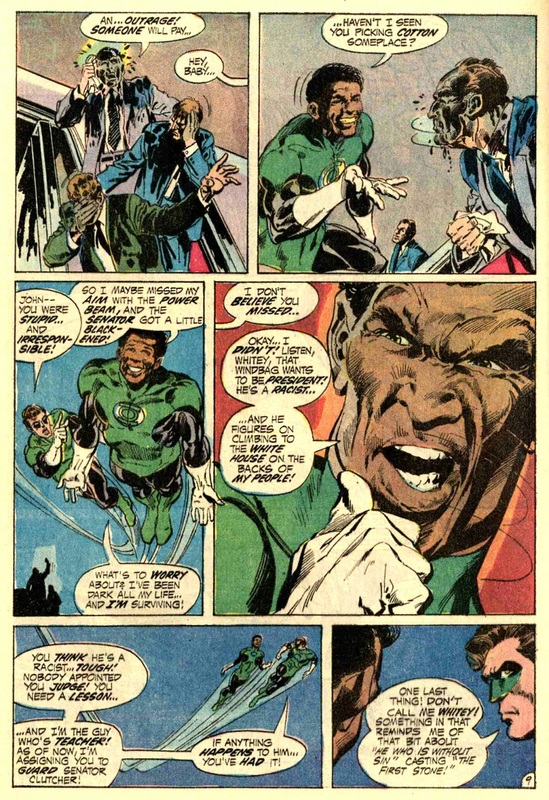 And I doubt Hal's objections were based on race anyway. Then on what? He actually handled that situation well and even the cops partner sided with John. ".... chip on his shoulder the size of the rock of Gibraltar." 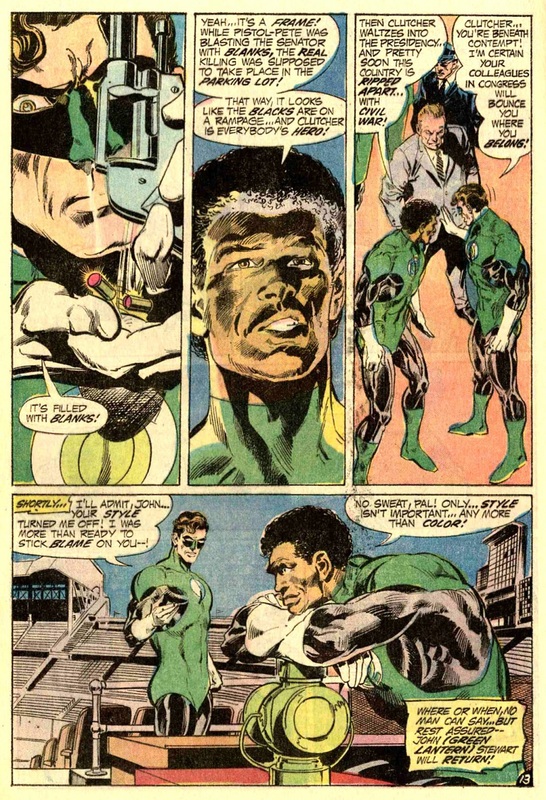 Hal clearly didn't have a problem with him being black, rather than being headstrong and kinda obsessive (not that he didn't have a reason during those times, but that's still not the best recommendation for handing over the most powerful weapon in the universe). And seriously, seeing the rest of this does Hal really come off as racist? 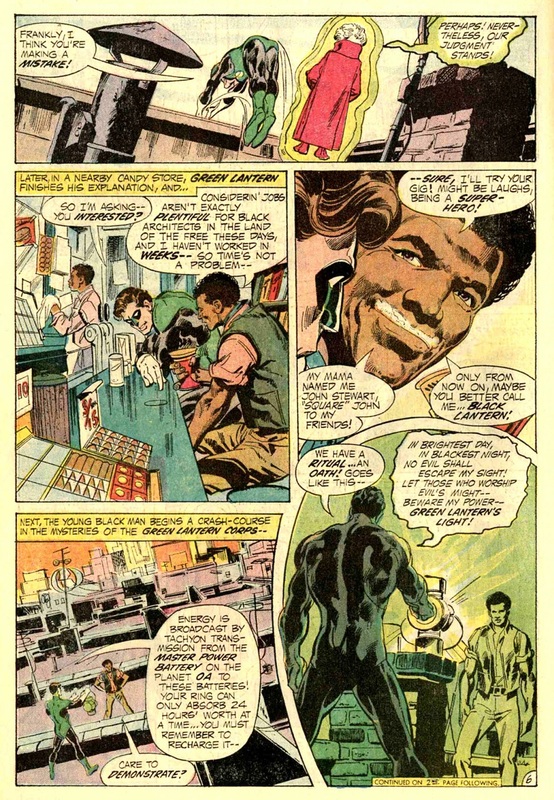 And then there was the time Hal was mildly shocked to discover Coast City now had a black mayor since he'd been away. Um. Yes, actually? Not willfully or maliciously, but, yes. The anger and headstrongness of black people and especially black men is heavily policed and viewed with suspicion. As you say, John has good reason to have a chip on his shoulder, but he still handles the situation calmly and the cop's own partner is on his side. Hal zeroing in on John's anger over his bravery, honesty and having "the right kind of mind" doesn't reflect well on him, imo. Then on top of that he dismisses John calling Clutcher racist ("You think he's a racist [...]") despite the fact that Clutcher is openly racist and even dismisses the disgusting falsehoods Clutcher preaches with basically, "Ah, well, free speech, am I right?" And, no, I don't give him points for calling it nonsense first. 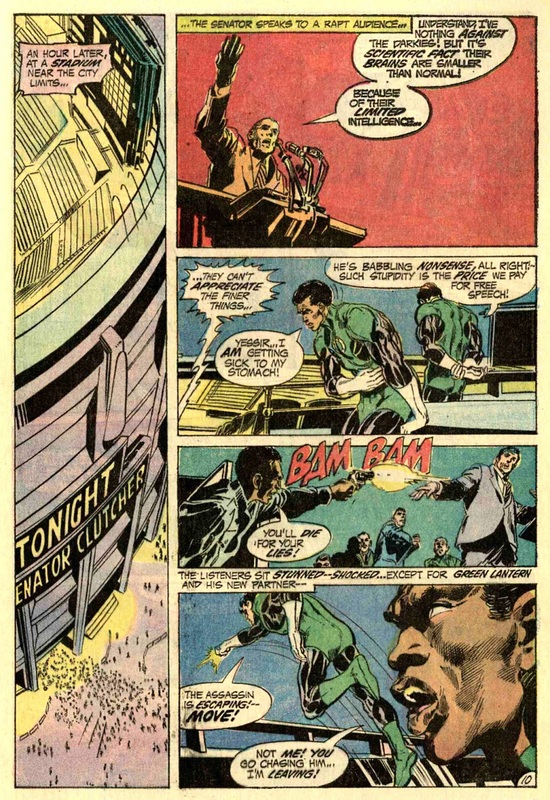 What about John calling Hal "whitey"? 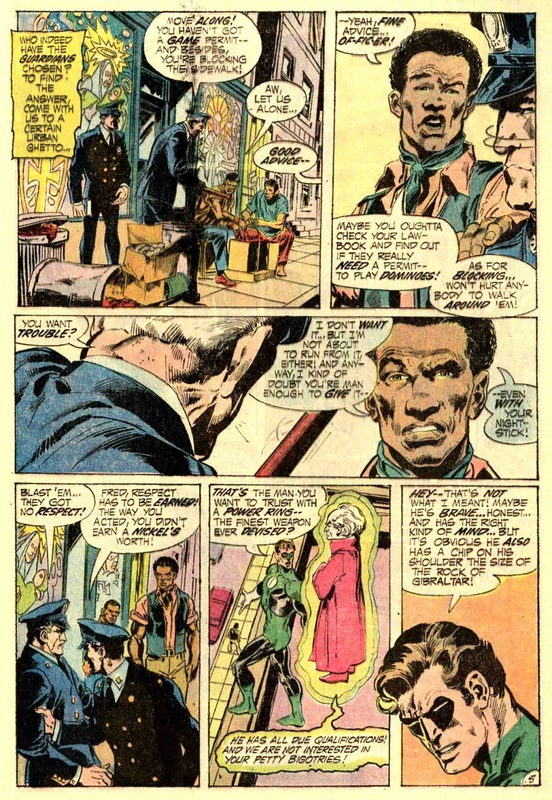 Long Version: Hal got upset on being called "whitey" and told John to stop that, yet the racist prick was able to spill all it's garbage. How is a racial insult not racist? I don't consider it racist, no. Even if I did, it would have no bearing on my reading of Hal, so I'm not sure why it's significant to this discussion. Anger, however justified, and the most powerful weapon in the universe still isn't the best combination. Wrong colour spectrum, and not the skin. And to me the operative part on that second exchange was Hal telling John that it's not their place to be judges. The wording of the first part is unfortunate, but putting both parts together I don't quite see it as damning. And free speech did protect the drivel at the time, some politicians still seem to get away with it, so what else could he do? Nothing in that scene suggests that John would let his anger get the better of him with the most powerful weapon in the universe in hand, though. Heck, Hal gets more worked up than John does (not angry, exactly, but certainly more expressively emotional). And if Hal had just told John it isn't there place to be judges, that would be one thing. Put together with the first part, it comes across as him saying not to judge Clutcher based on unfounded feelings or opinions. Free speech protects a lot of drivel to this day. That doesn't mean that the right response to someone expressing disgust with it is "they're allowed, though." John isn't threatening or even questioning Clutcher's right to say what he's saying, why does Hal need to bring up free speech at all? Actually, Guy Gardner was a model citizen before he joined up with the Green Lantern Corps. He was a special needs teacher who was only passed up for the ring originally because Hal Jordan was closer. When John Stewart was selected, the only reason Guy wasn't was because he was in a coma after having saved a kid from a bus. He was a better person than Hal Jordan by every conceivable measure, until he got trapped in the Phantom Zone and tortured by the villains there while Hal went on to marry Guy's girlfriend. It wasn't until Hal and Superman saved Guy from the Phantom Zone that Guy became a jerk, and that was only because of the literal brain damage he sustained from his torture in the Phantom Zone. Rather than try to get him treatment, the Guardians used him to do horrible things. So, no, Guy Gardner was not a bad choice. He was arguably the best choice, at least at first. It wasn't until the Guardians forced him to serve while suffering from massive brain damage that he became the jerk we all know today. At least in the original continuity. Guy was a good choice when he was considered, yes, but not when he actually got it. Not his fault, but still further proof that Guardians' judgement is very suspect. No, he got it before the brain damage. He was still a good pick then. Things didn't go poorly for Guy until after he was made a Green Lantern. And I say that knowing that his father was an abusive drunk who beat him regularly and that he was in a coma from being hit by a bus. Yes, his life actively went downhill after having joined the Green Lantern Corps. That said the Guardians are jerks who make a lot of bad decisions. I can totally agree there. 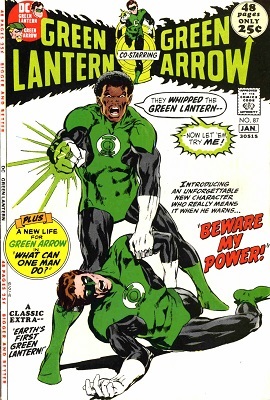 Didn't he only GET the brain damage BECAUSE of the work he was doing as a poorly-trained Green Lantern? Also, he didn't just get hit by a bus. He got hit by a bus off a cliff in an earthquake! As I recall, it was a direct result of him getting trapped in the phantom zone due to a broken Green Lantern Battery, and him getting tortured by Zod and other super-villains for months if not years. Ah, yes, that's right! It's been a while since I read up, you're totally right. And then he woke up and found out Hal had vamoosed with his girlfriend/fiancee. So wait, did Stewart know that it was a frame-up, or... kind of missing what his "style" actually accomplished here. Also, I hope he reconsidered that "Black Lantern" thing, considering. The Black Lantern saga would have been far more awesome if it had gone in this direction instead. "Huey Newton of Earth. Rise." "I am dead, you know." "Okay, that's cool, that's cool. Rise in both senses then. I'll wait." Hahaha, that would have been pretty great.